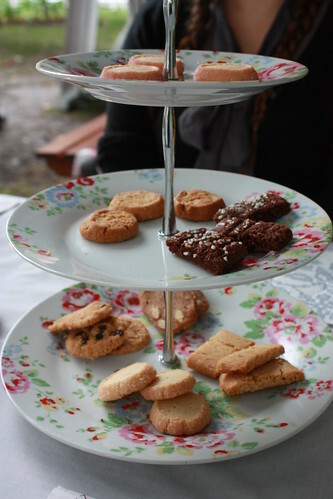 A few weeks ago, my friend Vixie and I went to an afternoon tea put on by Visit Sweden. Or rather, an afternoon coffee – fika, as it is called in Sweden. The tradition in Sweden evolved to serve seven different kinds of biscuit with afternoon coffee, so we were presented with seven kinds of delicious Swedish biscuit to try. My favourite was the Skurna Pepparkakor, and I managed to bully my gracious hosts into giving me the recipe! These are superb what with the piquant accent of orange peel in the dough adding a touch of finesse at the coffee table or at a mulled wine party. 1. Bring the butter to room temperature and sift the icing sugar. Add the dark brown sugar and spices. 2. Sift the flour with the bicarbonate of soda and mix into a pliable dough. 3. 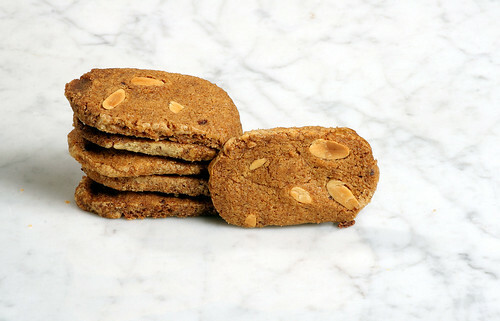 Finally, mix in the almonds and orange peel. 4. Shape the dough into logs, 3cm wide and 6cm high. 5. Freeze the logs for 2 hours. 6. Preheat the oven to gas mark 6, 400°F (200°C). 7. With a very sharp knife, cut the dough into slices weighing approx. 12g and lay them on a baking tray lined with baking paper. 8. Bake the cookies for about 10 minutes until golden brown. Sweden is such a beautiful country, the fact that the food is also excellent is icing on the cake – literally! I’m desperate to get back there one day. If you want to go, Visit Sweden are running a competition at the moment, all you have to do is “like” this Facebook page. Vixie blogged about the fika too – read her post here. Her blog is awesome. Lovely scaly London water has a nasty habit of clogging up the shower head (as well as the bath, kettle, draining board, and probably my kidneys). Ordinary white vinegar is brilliant at getting rid of the stuff though. I buy it from my local cash & carry, in an enormous bottle for £4. Leave upright for an hour or so and you’re done! 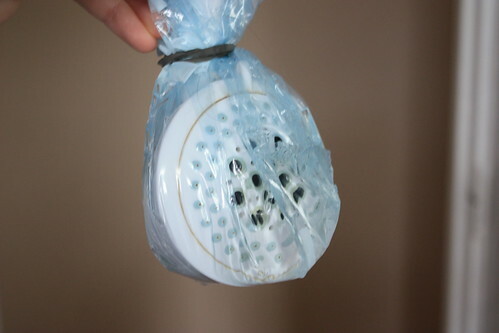 It can help to give the shower head a bit of a wipe before replacing it too. Writing about this now is killing me, as I’m on a bit of a diet. I had a temporary flatmate for the summer, from the States, so naturally this involved a cultural exchange of desserts. She made an amazing apple pie and I introduced her to pavlova. Much debate exists over whether pavlova is a New Zealand or Australian dish, I don’t really care, but it looks like it was possibly first made in New Zealand but first called pavlova in Australia. So we can both claim it. These days I actually use Delia’s recipe, which is probably quite unpatriotic of me but I like that it only has two ingredients – I’m used to adding white vinegar or cream of tartar or whatever but Delia’s recipe works really well if you follow the instructions to whisk the egg whites until they stick to the bottom of the bowl. 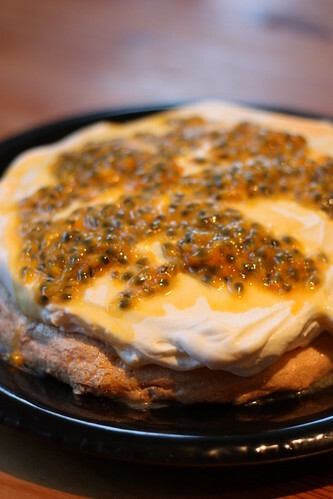 In fact, the pavlova in the picture above didn’t even crack – that’s the gold standard everyone aims for, even though it doesn’t matter because you’re going to cover it in cream anyway. Yum. Incidentally, I recently went to Bill’s cafe in Reading and ordered the pavlova there, which came with cream and strawberries. Bill’s was lovely, but the pavlova was NOT pavlova. It was a rock hard meringue. Wrong, wrong, wrong. Have you made pavlova? If so, what are your favourite toppings?